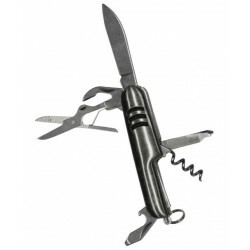 10 in 1 Swiss Knife Features: Excellent Camping Gadget All in one Penknife Has Good Siz..
Multi Tools Key Chain Features: Excellent Camping Gadget All in one Penknife Has Good S.. Features: Set of 2 Universal Wrenches Is_customized: Yes Material: Carbon Steel Size: 9-.. Features: cutting copper,titanium,stainless steel and aluminum tubing. tube cutter sta..